Over the years, the concrete used to reinforce the original walls of two of the cooling towers had developed voids, generated through delamination of the secondary skin from the inner wall of the cooling towers. CCL was presented with the problem of how to fill the voids without damaging the existing walls. Several specialist contractors had been unable to provide a viable solution when CCL was called in. Within 14 days, the company had devised a solution, trialled and tested it, had it approved to the complete satisfaction of all parties and had mobilised its workforce to begin remedial action. 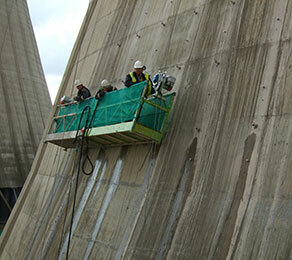 The system was capable of grouting the voids of the cooling tower from low levels to heights in excess of 100 m.
As the specialist concrete repair company, CCL was able to offer a practical and realistic solution.